We are supporting Honiton & District Lions Club in this concert in aid of Honiton Lions Charities. It is a pleasure to welcome our guest artist, Emily Morrison, on flute and soprano. Tickets at £8.00 each are available in advance from Fulfords Estate Agency in Honiton. Any unsold tickets will be available on the door but we recommend buying in advance. We are pleased to present our Summer concert "Songs from the Musicals" with special guest Anne Kiloran. Admission £10 stalls, £12 Raised. OAP £2 discount. Tickets from the Pavilion Box Office. 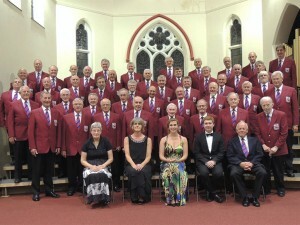 We are off to France with Barnstaple Male Voice Choir. There is rumour that red wine improves the vocal chords so we are going abroad to test the theory. Concert details will follow soon of our future event to raise funds for Ottery Hospice with Devon Fire Band. We shall once again be singing at Crediton Parish Church on Saturday 24 March 2018, starting at 7.30 pm. Guest Soloist is Timothy Parsons, Assistant Director of Music at Exeter Cathedral, who will be playing a selection of Organ Solos. Crediton Rotary Club will be raising funds on behalf of Age Concern Crediton. Tickets are £10 (including a glass of wine) available from Age Concern shop or Lee Outfitters, High Street, Crediton. 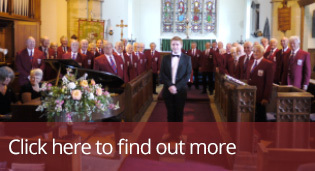 Join us on Saturday 17 February 2018 for a more informal concert at Sidmouth Rugby Club. More details to follow. We are joining with a number of other local choirs for a festive celebration. Make your Friday night special. FREE admission (booking essential) with a retiring collection towards the work of the Cathedral’s outreach in the city. Join us on Wednesday 6 December 2017 at 7.30 pm in the Rolle Arms Hotel, East Budleigh for a sing a long event. A small group of choir members with our own Rick Wakeman on the keyboard will be encouraging audience participation. If Rick can't be there Peter Dolling will deputise on the ivories.